This page contains FAQs on the upcoming YU Yuphoria. The FAQs have been based on the questions we have been asked on our Facebook Page. If the answer you're looking for is not available here, please leave a comment here or on our FB Page or email us at info@yurekasupport.com. Important Question : What's the price of Yuphoria? Answer : The price of Yuphoria is ₹6,999 only. 1. When and where can I get the Yuphoria Phone? 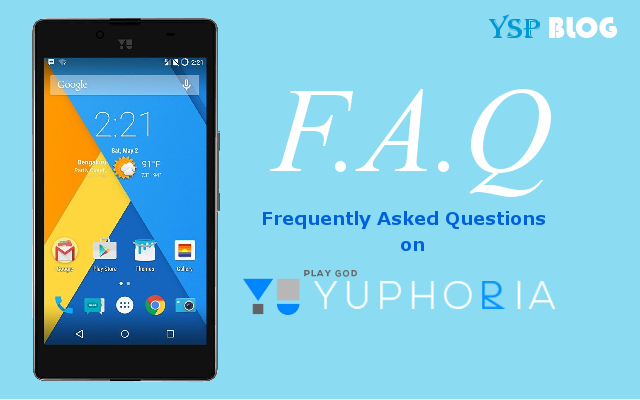 Ans : Yuphoria is available exclusively on Amazon India website on pre-registration basis. It goes on sale every Thursday at 12 PM. 2. Where can I register for the sale? Ans : You can register here: YU Yureka Plus Registration Page. 3. I missed the registration process, can I participate in the sale? Ans : No. Sorry. Sale is registration based you can wait for the next sale date of which will be announced later. 4. How many units will be available each sale? Ans : Number of units per sale varies from 10,000 to 30,000 per week. 5. How long would it take the phone to be delivered? Ans : It depends on your geographic location. On an average Amazon takes 1-7 working days to deliver products across the country. 6. How do I return a defective product? policy. You can return your product within 14 days of date of delivery for a full credit of the amount you paid. 7. What are the modes of payment? Or, Is COD (cash on delivery) available on Yuphoria? Ans : Yes, as mode of payment is based on Amazon India's policy which includes COD. Other payment options include credit card, debit card, Amazon Gift Cards etc. 8. Is EMI option available on Yuphoria? Ans : Yes EMI is available as per Amazon India's EMI Policy. Read EMI Policy here : Amazon India EMI Policy. 1. What is screen size and pixel density? Ans : Screen size is 5.0" with IPS HD (1280*720) display. Pixel density is 294 ppi. 2. Does it have protection glass? Ans : Yes, it comes with Corning Gorilla Glass 3 and a scratch guard inside the box. 3. Tell me about the processor. 4. Tell me about RAM and how much RAM is available after first boot? Ans : It has DDR3 2GB RAM. After the boot approx 1.2 GB is available. 5. How much is the internal storage? How much is available for use? Ans : ROM or internal storage is 16 GB. 11.83 GB is available of which 10.92 GB is free to use. 6. Does it supports external SD cards? Can I move my apps to SD cards? Ans : Yes, it supports up to 32 GB external SD Card. Yes, move to SD card option is available. 7. How many sensors does it have? Ans : No. It does not. 9. What type of SIM Card does it supports? Ans : It supports micro-SIM in both the slots. 10. Will it support 2G sim? Ans : Yes. In one slot it will support 4G, 3G or 2G SIM in another it will support 3G or 2G SIM. 11. Does it have notification LED? Ans : No, It does not. 12. Tell us about the battery. Is it removable? Ans : It has 2,230 mAh battery which is removable. 13. What's the weight of the Yuphoria? 1. Tell us about the camera in Yuphoria. Ans : 8MP Auto Focus Rear and 5MP Fixed Focus Front Cam. 2. Does it support HD recording? Ans : Yes, 1080p ( 30 fps ) and 720p ( 60 fps ). 3. Does it supports slow motion recoding? 4. What are different photography modes available? Ans : Panorama, HDR, Landscape, Night Mode, Burst Mode, Slo-Mo and many more. 5. What are different filters available? Ans : Auto, Sketch, Neon, Night mode, Negative, Mono, etc. The camera interface allows to you to switch between filters with one swipe. 1. What is the warranty on my product? Ans : Your device comes with a 1 Year manufacturer warranty. Accessories shipped with the product comes with 6 months warranty. Read : YU Warranty Services and YU Warranty Statement. 2. Where would I go to repair my phone? Where is Yureka service center? Ans : Nowhere, the repair person will come to you all you have to do is call the customer care. 3. How do I contact customer care? Ans : YU Support : 1-8602-122-122. or you can write to support@yuplaygod.com. Amazon India : 1-800-419-7355 or 1-800-3000-9009. 4. Will rooting the phone or unlocking the boot loader void my warranty? Ans : NO. YU wants to encourage the developer community to work with them and create an ecosystem which thrives on consumer engagement. Thus, the warranty will remain intact even if the phone is rooted. Did not find what you were looking for ask us on our FB page or email us at info@yurekasupport.com.